It wasn't very long ago that the Suzuki Cobra 500cc two stroke twin was being brandished by Suzuki as the hottest thing on two wheels. By one of those ironies of fate they are currently running a series of advertisements on the latest version "running cool even in Death Valley" just as we have the latest 1974 model on test as an example of a mild cool, middleweight machine. 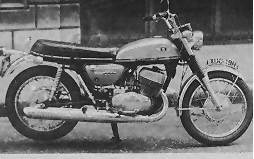 It's funny how a few years and a single model can transform a commen view: the Honda 750-4 completely changed the face of motorcycling with the coming of the technical masterpiece with civilised appurtenances. Now one looks beyond a Honda 4 and seizes on the latest Italian nine-days wonder; the Four is a part of every day motorcycling. The Suzuki T500 arrived in a world that regarded a big twin two stroke with great reserve, almost mirth. Yey after the horrific fuel consumption of the first Cobras had registered, the realiability moan vanisheds, and now that the T500 is quiet ecomomical and nice to ride, it is almost a standard "it's solid, realiable, good value and big enough to do most jobs well" motorcycle - much to Suzuki's satisfaction, as well they keep on wheeling them out in their thousands. But the T500 has been completely buried by the tide of big and shiney motorcycles, and somehow takes a back seat to the watercooled 750 or the 550 three twin with it's fancy four pipes. Yet, take a look at the production racing results: TT wins and 500 Miler victories have left their mark on the sales figures, and after the TT victory the sales gave a mighty bound, thereby directly influencing the decision to form the Suzuki GP racing team. At club and national race meetings up and down the country the Suzuki 500 is a surefire runner in the PR classes, and in the absence of Yoshimura'd Honhas they tend to win, too.... and in very standard trim indeed. The Suzuki is a big small machine: it does not have the height, the mass, the width or the weight of the modern 750's or even "500"s" like the 550 three. The handleing of the machine about the garage is of a small machine, and the slim seat helps to retain this feel when on board. Once moving, the 500 has a quite remarkable ability to pull high gears at low r.p.m.. This is really a big bike feature - and is not adequately present in the R75/5, and helps immeasurably to give a relaxed and controlled feeling to the machine on the move. The carburation and portingalteration introduced as an almost immediate reaction to the reception of the Cobra have given the Suzuki a delightful spread of torqure: 2000rpm in top gear is quite acceptable to the motor and the engine pulls sweetly up to abour 3500rpm or 4000 before vibration set in. When the vibration does start it is severe andf becomes quite remarkably uncomfortable above 5000. To use the 500 to full rpm limits is an unrewarding experience as ones foot can be firmly but seadily shaken off the footrest, as ones hands go to sleep under the shaking. The front brake is a twin leading shoe affair that works adequately, but it is difficult to be enthusiastic about it as it simply works, fading a bit as it's used, and always stopping, the machine with a faintly tired air. The tyres front and back seem to fit the vintage Japanese theme of the T500. They grip well enough in the dry, although the squeals at mild brake preasure discourage one from pressing the front too hard. The rear tyre is fine in the dry except for the distinct tendency to track along the linnes of the road, but then once the wet weather arrives..... I had two unnerving slides under very mild low speed braking in the wet, and felt very wary from then on. On the race track the T500 has proved itself over and over, once given the advantage of a good set of tyres and damping. The front mudguard is solid and works well, keeping much of the water from the rider instead of ading it in it's progress onto the riders knees as is done so successfully by certain other makes. The headlight at one time might have been reguarded as excellent but the presence of 12V equipement on even Italian machines has now deprived the Suzuki of any distinction in this quarter. The main beam was adequate for the job, and the dip suffered from a strange pattern that did not seem to be very sensibile. The handlebar controls for the lighting where very neat and easy to use, and the well lit ans well marked tachometer and speedometer are equally well designed. The handlebars are high wide and ugly. They are rubber mountet in a vain attempt to hold vibration at bay, and to rub in the hopeless attitude of the designers even the handlebar mirrors have rubber isolation in the stem to make the mirrors usable. The depressed engineer who decided to go to these lengtht might take some heart from the fact that both handlebar and mirror isolation work well over a considerable range of rpm, and it is hardly possible to carp when the vibration only gets through outside the normal crusing range of rpm. The tank looks a lot bigger than it is and, in spite of the great improvement in fuel consumption over the Cobra tested about six years ago, the 2.8 gallons that went in only produced between 38 & 42 mpg in mixed town and country use. The crusing speed of an indicated 85 on motorways for 30 miles at a time required full throttle and was in fact the top speed under these conditions on many occassions, although once an indicated 95 - 100 crept up under favourable conditions. The overall performance was closely similar to the old Yamaha 350cc R5 model up to 80 mph, and rather worse than the 380 Suzuki subsequently. Two up the T500 would hold an indicated 80 with little if any to come, translating to about 75 real mph. Not too different to any other 500 or good 350, really, and probably a bit more economical than any 350 could manage at that sort of speed. On reflection, 80 two up sounds so slow: the degree or exaggeration of modern "speedometers" is such that one hears complaints that 350's won't hold 80 two up on wide handlebars.......... which, when converted into straight bars and a solo rider, equates to around 100mph in general for bikes of a 350c.cc. styleof torque. The Suzuki shows its strength here, and really eats up the distance into wind and two-up. With the wind behind, the Suzuki was flogged up to an indicated 90-93 mph and the attendant vibrations were so severe that the passenger lost her grip on a sweater that she was carrying when shifting around to try to escape the toothgrinding tingle. Let the Suzuki drop back down to about 60 and it is mild and smooth enough for comfort. The rate of oil consumption is remarkably low: the level barely shifted over several hundred miles. The Suzuki positive feed system is much more efficient in its use of lubricant than the Yamaha or Kawasaki variants. The oil pump assemblage is fitted to the top at the rear of the crankcases, and the feed pipes can be seen twisting their way to the crankshaft bearings. The gearbox has five speeds and a very nice action. Switching from a BMW to the Suzuke gave it a pretty easy mark to beat, but the comparison with a Yamaha RD250 gearbox placed the Suzuki firmly as a good gearbox by the standards a few years ago. Positive, but heavy, with a long action, it was difficult to miss a gear and engagement was commendably quiet. The wet clutch dragged a little and made neutral selection difficult at a halt. Once on the move the neutral selection was precise and easy to engage. 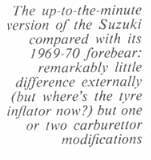 A dated feaure was the lack of a primary gear kickstart engagement point; one must find neutral to start the Suzuki, and had it been easier to obtain neutral it would have seened less of a fault. The seating position was good, and a 40-mile trip led neither to discomfort nor to fatigue on the part of machine or rider. 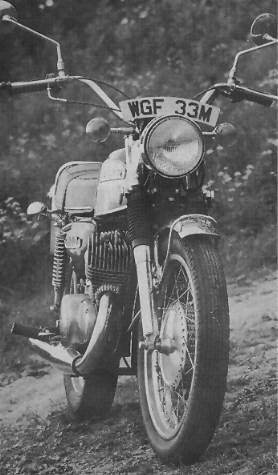 This waws perhaps the best feature of the Suzuki: it could be caned as hard as the rider could stand it, and not wilt. The Suzuki really gets its own back on anyone who treats it so severely and the discomfort at 6,500 r.p.m. is equalled only by the 650 c.c parallel twins that are now nearly defunct. The Suzuki was very much at home in congested traffic; the immediate response to the throttle, the wide spread of torque, and the crisp gearbox provided just the right set of characteristics for decisive town manoeuvring. The Suzuki is lighter than most medium-sized machines now sold, and weighs about 420lb or so. This is enough to sustain strong gusting motorway winds with some stability, and yet light enough to throw about with fair abandon when the opportunity arises. The T500 was one of the nicest machines to use to travel 40 miles each way each day to London on, and one of the least fatiquing to drive in the heaviest traffic. On backroads the Suzuki's suspension showed up rather better than it did on main roads. 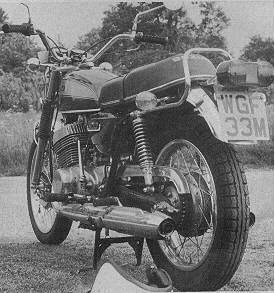 On smooth motorways the odd bump seemed to produce a painful jar, but once the suspension was working on undulating and bumpy lanes the Suzuki was far more comfortable to ride, and displayed a capacity for soaking up really nasty-looking holes withour passing the jolt to the rider. The 500 Suzuki has remained virtually uncchanged for most of its six-year life, and probably owes its present existence solely to the American AMA racing regulations. It has a very fine reputation for reliability and strength, and a string of major Production race successes. All this well proven product is worth a second look: the enviable stability of the machine has ensured that all the results of the "early sorting out" have been incorporated for years, and the customer can purchase a really well proven all round machine without the blandishments of instant redesing every year. Unfortunately six years is a long time, and the new round of 350 machines have the T500 taped. 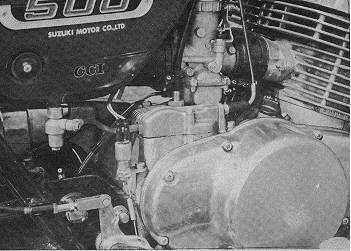 Suzuki's own 380 underdells. out accelerates and out handles the T500. 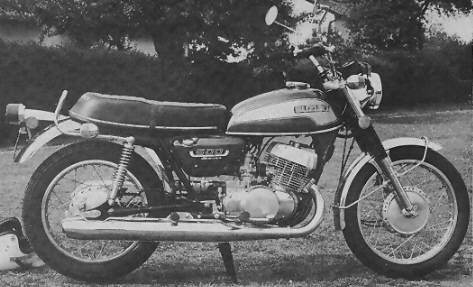 Yamaha's RD 350 will do the same, and Susuki's 550 three concedes only too much weight to the older twin. Yet all these comparsions can do little to disguise the fact that the T500 twin will do almost everything that one would want from a motorcycle, and has been relly well proved and not subjected to yearly replacements like so many others from Japan. The simplicity of the two stroke twin is a real advantage. Now that the T500 has sat back on it's laurels it will be shortly replaced by a far more complicated and expensive beast that will require far longer to deal with when something goes wrong. The T500 may well be a visitor left over from the 60's but it fills a real slot in the market. Dated now, but with a friendly rugged character, the T500 is likely to continue to appeal to a sizeable group of motorcyclists for quite a while yet.